A sleep test, called a polysomnogram, is a painless overnight test to either test for sleep apnea and other disorders, or to titrate your CPAP machine to the appropriate pressure. At first, it might seem uncomfortable. However, if you become familiar with the procedures for a sleep test, you will know what to expect and it won't seem strange or scary. Make sure your sleep study is approved ahead of time through your insurance company. Stanford Hospital makes several recommendations to prepare for your sleep study. Bring your insurance information and the referring physician's information. Bring items you will need for your nighttime routine, such as pajamas, toiletries, a change of clothing, and things to do that will help you sleep, such as a book, a laptop, or a movie. Bring your bath soap and shampoo. There is usually a shower available to you, so you will be able to take a shower the next morning if you need to wash off the glue from the electrodes. Children can bring a toy or stuffed animal. A parent can stay overnight in the room with the child. Make sure you eat a meal before your arrival. Also, it is recommended you take a shower or bath and wash thoroughly before your arrival, otherwise the natural oils in your skin and hair could prevent the electrodes from sticking onto your skin. Your particular sleep study center will most likely have other suggestions for you to follow to help your sleep study be as successful as it can be. According to the Sleep.org, you will arrive at a designated time in the evening for your sleep study. A sleep technologist will get you settled in your private room. When you arrive to your room, you will change into your pajamas and fill out paperwork. The sleep technician will apply the electrodes and sensors for the various machines. You can go to sleep at your normal time, but keep in mind that the technicians will have more time to evaluate you the earlier you get to sleep. Technicians understand it is difficult to sleep in a different environment and with the addition of the equipment. Don't worry if you're not able to sleep as much as you normally do. The technicians will be able to take their measurements as long as you get some sleep. Once you have arrived and are settled in for your sleep study, there are a number of procedures that will be performed so the equipment can measure your sleeping behaviors and physiological responses throughout the night. The National Institutes of Health describes the procedures your sleep technician will follow to measure your physiological sleep patterns and the purpose of the equipment. Electrodes are typically applied to your face, neck, chest, arms and legs, head, and finger. Belts are wrapped and secured around your chest and stomach to measure the frequency and intensity of your inhalations. The wires going to the electrodes and monitors will be bundled together so they will keep out of the way and not disturb you while you sleep. The information will be relayed to the devices and the sleep technician in another room, who will collect your information throughout the night to compile in a comprehensive report later on. Stanford Hospital describes the three different types of evaluations for sleep apnea. This will affect whether or not you are able to sleep for a full night or if you will be awakened in the middle of the night. A Diagnostic Evaluation will simply record your body's nighttime activity in order to diagnose your sleep time issues. In a Continuous Positive Airway Pressure (CPAP) Titration study, it has already been determined that your breathing during the night is disordered and the technician will adjust your CPAP machine to make sure you are breathing freely throughout the night. In a Split Night Study, the first part of the night will be devoted to diagnostics. This is used for cases where sleep disordered breathing can be determined in the first half of the night. Then the technician will wake you up and explain to you that your diagnosis for sleep apnea has been confirmed and help you adjust your CPAP machine for the rest of the night when you go back to sleep. 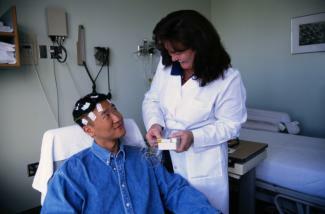 John Hopkins Medicine explains what you will be assessed for during a sleep study. They track the phases of sleep you experience through the night by taking different measurements. Your brain activity, measured with an electroencephalogram (EEG), indicates what phase of sleep you're in. Your eye movements, measured with an electrooculography (EOG), will also help determine if you go into REM sleep or not. An electromyogram (EMG) will measure your muscle tone. Your inhalation and exhalation is assessed and recorded for amount of air intake, the presence or absences of snoring, and the amount of oxygen. They also diagnose for restless leg syndrome and observe and record your heart rate with an electrocardiogram (ECG). All of this information will be used to diagnose your particular sleep problems, as well as rule out other sleep or medical disorders that might mimic the symptoms of sleep apnea. According to Sleep Education, the following morning, you will be awakened at a designated time and the technician will remove the electrodes and other equipment. This indicates the end of your sleep study. You will most likely be able to shower and you will be asked to fill out a survey and other paperwork. You will not receive your results immediately. Usually, you will receive the results from your doctor within a week or two.